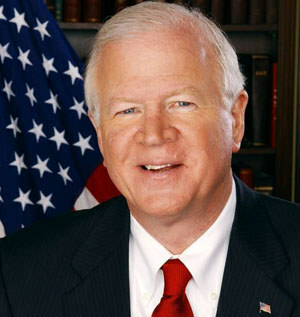 ATLANTA, Dec. 2 - Republican Saxby Chambliss easily fended off Democratic challenger Jim Martin Tuesday to keep his seat in the U. S. Senate for a second term. With 96 percent of the votes counted, Chambliss led Martin 58 percent to 42 percent, The Atlanta Journal-Constitution reported. The two former fraternity brothers faced off in the runoff after neither received a majority in the Nov. 4 general election. With the Democratic Party trying to reach a filibuster-proof 60-member majority, the race attracted a lot of national attention, with both sides pulling in big-name politicos to bolster their campaigns. The Democrats hold 56 seats and two independents caucus with them. Chambliss kept the Georgia seat in the Republican column and still outstanding is Minnesota, where Republican incumbent Norm Coleman is locked in a recount with Democratic challenger Al Franken.